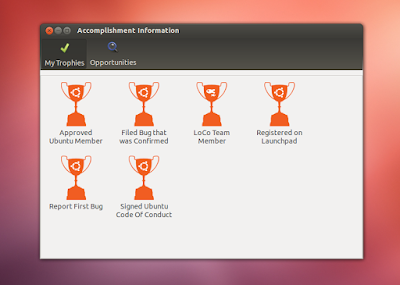 Four months ago Jono Bacon, the intrepid Ubuntu Community Manager, laid out plans for an Ubuntu Accomplishments application that would award users for accomplishing activities that would potentially forward the Ubuntu movement. Accomplishments range from the basic tasks of registering with Launchpad, signing the Ubuntu code of conduct to more prestigious triumphs like becoming a community council member or an Ubuntu core developer. This app has now been realized. A ton of work has gone into this project. The Ubuntu community is alive and well and continues the momentum of innovation other linux distributions rarely see. The first release of this app showcases some features but is no where near complete. Its worth installing and “checking” off items you have accomplished and it will give you goals to work for as well. You can only install this on the new recently released version of Ubuntu 12.04 Precise Pangolin and its easy to do. You will need to install the PPA so updates for this app will be automatic for you. That should do it. Now go up to your Unity dash (top left) and type in “accomplishments” and you should find the newly installed app. Click to run it. If you already have a Launchpad account, click that trophy and type in your Launchpad email. This clever app will extrapolate your data from your account and award you trophies accordingly. Great job Jono and to all who worked on this!